Book: 2 Corinthians (5), 1 Peter (1). Series: Featured (2), Repentance (2), Miscellaneous (1). What Actually Happened On The Cross? 2 Corinthians 5:20-21 (Part of the Featured series). Preached by Larry W. Dean on April 17, 2016 (Sunday Morning). 2 Corinthians 13:1-13 (Part of the Featured series). Preached by Larry W. Dean on December 27, 2015 (Sunday Morning). 2 Corinthians 8:1-5 (Part of the Repentance series). Preached by Larry W. Dean on September 30, 2013 (Sunday Morning). Repentance02, What Comes With It? 2 Corinthians 7:8-11 (Part of the Repentance series). 2 Corinthians 7:8-13 (Part of the Miscellaneous series). 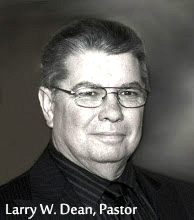 Preached by Larry W. Dean on November 13, 2011 (Sunday Morning).